Nice and quiet in Cornwall again with just a few services changing. Just had to include this smashing shot of First Kernow 33177 in the brand new livery for the Atlantic Coaster. They spray their buses up lovely, but it's still the same ageing vehicles they use! Surely a company as big as First should be able to buy a few newer buses? Most of their fleet are way, way past their best! At £220,000 each it takes a lot of passengers to generate enough money just to buy a single new double deck, after paying wages, for fuel and maintenance. Even a single deck is around £150,000. I'm sure they buy as many as they can. To buy new is expensive but to put in new seat cushions so you can at least sit down isn't. Also sealing the holes to stop rain coming in is cheap. If they put tree protector bars on roofs their buses wouldn't have so many gaping holes in bodywork either. The 17B I was on last week was closed top but had so many holes in windows and the roof it felt open top! Also why advertise 17B as open top when more than half of them aren't and they don't sat which ones will be. 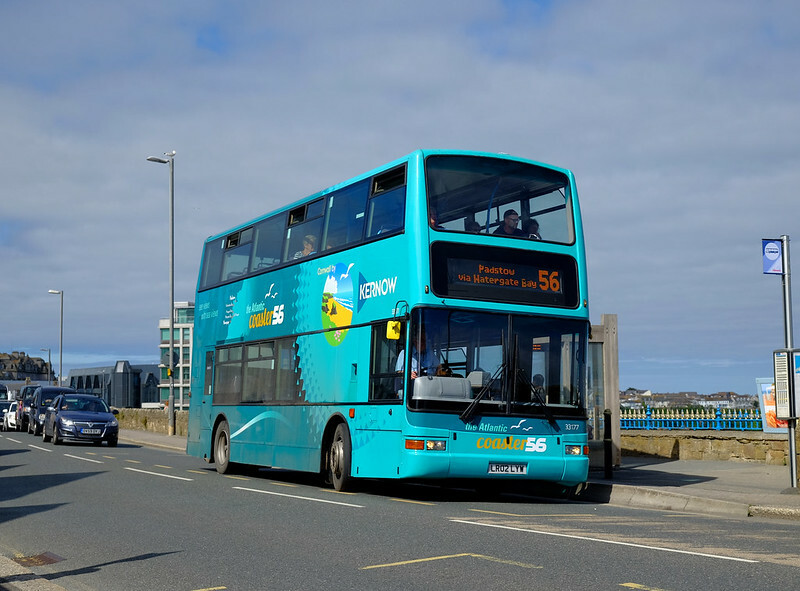 The problem of branches is a common one which the council is supposed to ensure are cut, the fact is Cornwall council don't and the result is both first and citybus as documented here suffer. It is I am afraid another example of the country's failure to prioritise public transport, another good example being setting traffic lights so that when buses approach the lights set AGAINST the buses the only council to do this. Added to Road projects undertaken by the council owned Road contractor Cormac whose inefficiency is legendary in the country where at the moment cycle lanes are being built which are impractical to cyclists and thus are largely unused when Hugh amounts of money. Months of disruption to build them resulting in sections of route inoperable as a result for nine months at a time. Now the council are supposed to be transport coordinators, fact is they have not a clue. It doesn't sound as if you like Cornwalll Council! I used to live in a cul-de-sac in Harrowbarrow and had a big Scots pine in my front garden. Obvmiously one of my neighbours didn't like it and I received a notice from the council that I must cut it back so that there was 16 feet of headroom under it. I treated the notice with the contempt it deserved and ignored it. I heard no more. I was, though, strictly in the wrong as landowners who have trees overhanging roads do have to make sure that nothing overhangs the road below 16 feet. Farmers with trees in hedges which overhang main roads are not always assiduous tree trimmers. Time was when bus companies had old buses converted to open-top tree-cutting vehicles. Thanks for this as I had not seen it! Keith a lot of people in Cornwall have the utmost contempt for Cornwall Council and their officers. If you look at the Bodmin situation a lot of services by First and Citybus are unable to serve Morrisons which is the only supermarket served by the 27 along it route between Truro and Bodmin via St Austell. Part of the Road Closures have already started and I understand that Asda as a result have already noted a significant drop in trade and this will extend to Morrisons from next week. Many of the passengers on the 27 in off peak periods are Pensioners who probably rely on the fact the bus goes to Morrisons in Bodmin. The issues for Asda could be improved with some Traffic Lights by the Vauxhall Garage in Bodmin but instead Cormac allow the situation to descend into Chaos. Bear in mind this is the same Cormac who caused chaos to Western Greyhound with the A391 bypass at Penwithick, who are running late with the A30 and could not deliver the 2 lanes in each direction for the summer causing chaos to traffic trying to enter Cornwall at the weekends for the very important tourist season and the same Cormac who built a road in Newquay which had to be widened because it was built to narrow. So No I think the Council and it's inhouse Cormac are incompetant and frankly lazy because they don't work over the weekends to even try to keep ontime and thus they don't. Compared to Malta Public Transport Roadbuilders they are absolutely the pits. We are now advised that the Dennison Road closure will be 12 months.So in effect the Council hav elied by saying it will be 40 weeks.